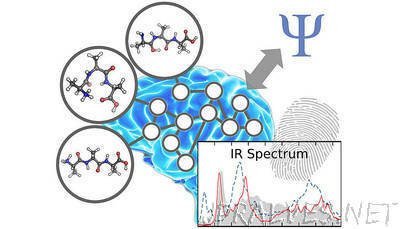 “Researchers at the Universities of Vienna and Göttingen have succeeded in developing a method for predicting molecular infrared spectra based on artificial intelligence. These chemical “fingerprints” could only be simulated by common prediction techniques for small molecules in high quality. With the help of the new technology, which is based on neuronal networks similar to the human brain and is therefore capable of learning, the team led by Philipp Marquetand from the Faculty of Chemistry at the University of Vienna was able to carry out simulations that were previously not possible. The potential of this new strategy has now been published in the current issue of the journal “Chemical Science”. Drastic advances in research of artificial intelligence have led to a wide range of fascinating developments in this area over the last decade. Autonomously driven cars, but also everyday applications such as search engines and spam filters illustrate the versatility of methods from the field of artificial intelligence. Infrared spectroscopy is one of the most valuable experimental methods to gain insight into the world of molecules. Infrared spectra are chemical fingerprints that provide information on the composition and properties of substances and materials. In many cases, these spectra are very complex - a detailed analysis makes computer-aided simulations indispensable. While quantum chemical calculations in principle enable extremely precise prediction of infrared spectra, their applicability in practice is made difficult by the high computational effort associated with them. For this reason, reliable infrared spectra can only be calculated for relatively small chemical systems. An international group of researchers led by Philipp Marquetand from the Faculty of Chemistry at the University of Vienna has now found a way to accelerate these simulations using artificial intelligence. For this purpose, so-called artificial neural networks are used, mathematical models of the human brain. These are able to learn the complex quantum mechanical relationships that are necessary for the modelling of infrared spectra by using only a few examples. In this way, the scientists can carry out simulations within a few minutes, which would otherwise take thousands of years even with modern supercomputers - without sacrificing reliability. “We can now finally simulate chemical problems that could not be overcome with the simulation techniques used up to now,” says Michael Gastegger, the first author of the study.